Today I added some brilliant 1:6 scale light fixtures to my Etsy shop. These light fixtures are Lithium battery operated LED lights … no wiring, just flip a switch. They are **stunning**. Perfect for the 1:6 scale fashion doll collector to use in room boxes, diorama or even just on display shelving atop furniture/props. These are going to be placed throughout my doll room displays. I just adore them. The candlesticks are perfect on top of the fireplace panels. These are also available in silver tone (p.s. I do have a pink/silver panel available in the shop right now). In my last post, I shared info about a new project that I was undertaking. 1:6 scale wall panels for doll photography. I believe that there has been a major void in the fashion doll collecting community for this type of product. I’m beyond ecstatic that I have found a quality supplier to produce them for me. I have finally made progress with getting these panels ready for sharing and selling. First, photos. And second, details. At this time, I’m focusing on 4 color schemes for these panels: White/Gold, French Blue/Gold, Chalk White and Pink/Gold. These will be sold in a shop I created at Etsy : Divinity Doll Decor. This opens the door for me to consider what I’ve wanted to do for a very long time – offer props and decor for the fashion doll vignette enthusiasts. This will be a work in progress as time goes on. Below are the first photos featuring my panels. This color combination is THE most perfect color combo! Pink/Gold – VERY flat & chalky. Those sconces are NOT included, but read on for details where you can purchase them. They are made of wood. Wood as we all know has rustic characteristics, keep this in mind when purchasing. They are hand painted. Each panel is unique and one of a kind. The measurements are: 18″ High, 15″ Wide & appx 1/2″ thick. At this time, I have VERY limited quantities. Please be patient as I have more in production. I cannot accept custom orders or pre-orders during this introductory period. But I welcome feedback as to which color combos above are the favorites. A few more details about the photos above: The Laduree 1:6 scale miniatures. Do you love them? So do I! They are beyond exquisite. And the icing on the French Macaron is that they are created by a very dear and talented friend – these are available to order from Rebecca’s incredible blog/website: Inside the Fashion Doll Studio. The quality of these bags/boxes is remarkable. Note that the gold foil on this packing is a true shiny, gold foil quality. No detail has been spared in the creation of these magnificent treasures. Spoil your dolls and add them to your collection! And then there are the sconces in the photos with the pink panel. Do you love them? So do I! They are brilliant. These LED sconces light up … for real … they are battery operated! They adhere via a magnet. No electric wiring! All you do is slide a switch at the bottom of the sconce. Where have these been my whole collecting life?! The seller notes that they are 1:12 scale, but I truly believe they work in a 1:6 scale setting with perfection. OMG they are an absolute perfect must have for the vignette enthusiast. They also have an incredible 1:6 scale chandelier available to order. I’m going to share where you can order these from as well: MiniLand.Canada. They retail for around $50 each (they go on sale regularly). The quality is well worth it. They are beautiful. And, MiniLand is a really lovely company to order from. Well packed and quick shipping. I highly recommend them. I should be going live with the panels within the next day or two. Keep an eye out at the shop for new additions. Gold/White will be going live today. Once I can figure out how to link the Etsy Shop here, I will come back and edit with info. White/Gold – Doll: Positively Plaid Poppy (Integrity Toys) / Sheath: OOAK sheath (purchased in 2004, I apologize I no longer have seller info) / Furniture: Sindy Hutch/Buffet customized by myself. French Queen Blue – Doll: Homecoming Queen Barbie (one of the most adorable Barbies on earth) / Sheath: OOAK sheath (purchased in 2004, I apologize I no longer have seller info) / Furniture: My Scene Barbie Table customized by myself. Chalky White – Doll: Mint Cool Misaki (Integrity Toys) / Sheath: OOAK Matisse / Furntiure: Regent end table. Pink/Rose – Fashion Luncheon Silkstone Barbie / Sheath: OOAK sheath (purchased in 2004, I apologize I no longer have seller info) / Furniture: BFMC Chair from Mattel/BFC chair customized by myself. A couple of days ago I stumbled across these acrylic doll display cases at Michaels Craft Store. They retail for $14.99 each. Michael’s “50% off one item” coupons are readily available – half price for one of these cases is an even better price. The cases are excellent for protecting and/or highlighting those special individual dolls and/or outfits that are a concern for collecting dust. They measure 5 x 5 x 13 inches. The front of the case is a completely removable lid for access to the interior. The acrylic is thinner than some of my other acrylic cases that I have in my collection, but I don’t mind, I like that they’re not as bulky. They are not a great option for large ballgowns or dresses with long trains, however I still think they’re an item of good value to sprinkle throughout a doll room mixed with other display cases. I collect various cases for creating displays within my doll room. Obviously they help protect from dust but they also add an element of highlighting a doll or a theme (for example, my “Cruise Ship Passengers” theme featuring the BFMC Silkstone “Boater” doll, pictured below). There are some dolls that just look great featured alone and deserve their own individual case. These are perfect for that. Great item to consider adding to your collection! I recently received a stunning repainted/restyled Silkstone by a well known and ultra talented artist, Jon Copeland/SeloJ Spa. You can view several of Jon’s repaints on his Flickr page (linked here with his permission). This lovely lady arrived just in time, as I was prepping a new temporary Dress Shop display in my doll room. I was instantly inspired to have a photo session. However, a huge problem presented itself: both of my (admittedly old and outdated) trusty digital cameras died at the same time. So I was forced to purchase another camera, of which I am still becoming familiar with. This is my first photo session with the new camera, all shot within days of receiving it. These can be found in the kitchen cabinet area at Ikea. They are called Variera. There are 10 white plastic plugs attached on 10 individual strips and they sell for 99 cents a pack (100 plugs per pack!). They are also available in black. For a clean look, I absolutely love the idea of filling in all the exposed peg holes in my shelving, so I took a chance on one pack to see if they would work. It turns out that they fit all the holes in my shelving throughout my doll room. I know MANY collectors have Ikea’s classic, affordable, and functional Billy book cases in their doll rooms. I myself have a few of the cases and I love them. I purchased mine prior to a change that has made to the newer Billy cases (I purchased mine in Jan/2012). Ikea has since changed the size of the shelf peg hole to a much smaller, less noticeable peg hole. The Variera plugs fit the holes in my Billy shelving, but they do not fit in the newer book cases. I do not know when the change occurred. I believe the plugs are intended for Ikea kitchen cabinetry, not for Billy book cases, but they seem somewhat universal. The pegs also happen to fit the non-Ikea book cases that I have had for the past 10 years that run along the main wall of my doll room. I have had these 5 matching cases for so long that I cannot recall if I got them from Office Max or Office Depot, but for a mere 99 cent investment, it was worth it for me to try them out in these cases as well. Unfortunately, my digital cameras all decided to break on me at the same time, so I had to take these pics with my phone camera. The lighting is not the greatest, but you get the idea. You do still see small white bumps when you view the cases, however, I prefer that look overall to the numerous and annoying open shelf peg holes. In my doll room, the shelving is very much set, so I don’t anticipate moving the shelves and having to remove the plugs. By the way, they’re easy to remove, but they do a number on your fingernails if you’re not careful. They may not be a good option if you’re constantly changing your shelf heights. Mine has been the same for almost 10 years, I think I’m safe. Final note, the plugs are fairly bright white. Some Billy cases are creamy white (I have noticed a variance in the shades from one Billy case to the next). The difference in shades between the Billy cases and the plug doesn’t seem to be significant enough to matter, but I mention it because it does exist. Over the years, I have modified (a few times over) how I collect. I have learned that for me, it isn’t always just a doll that interests me, it is also a doll’s surroundings. I have observed in the past decade or so that a new collecting breed has emerged. We are deboxers and display-ers. We want to be hands on with our collections. We want to enjoy and experience our collection, in the here and now. Obviously this isn’t to say that these collectors have not existed in the past, but due to increased photo sharing on the internet along with sharing on doll forums, we get a peek into the collections of various collectors and we are allowed to visually enjoy the collections of complete strangers. I have said on the forums that I am one who collects to enjoy my collection. I do not collect for future collectors. By this, I mean I do not allow myself to be chained to re-sale values for the future. 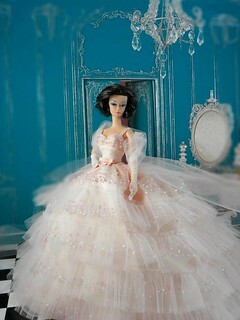 There are plenty of collectors out there from whom you may one day collect a lovely NRFB doll, all pristine and pretty. It takes all kinds in our hobby. I do not criticize any collector’s way of collecting. My intent is to share how I collect. I do keep several dolls NRFB. However, I debox a majority of my dolls. I do not fall victim to every single new hot off the press release. If I like a doll, I buy it, if I don’t, I pass. Around 2003, my collection habits started shifting, and I found the forums at Barbie Collector. It was as if the heavens opened up as the angels sang. I discovered a place where collectors shared photos of their collections and displays and dioramas. This was a language I began to understand immediately. LOVE your collection. ENJOY it. HOLD it. BUY your dolls furniture and tea sets and OOAK clothing and pets and anything else they demand that is too damned cute to pass up. Then you start adding coordinating backdrops, and it becomes a vignette. For me, I combined all of these new found elements of collecting with a love for photography, and suddenly my hobby transitioned from displaying boxed dolls to deboxing, creating scenes/dioramas/vignettes and then sharing. I want to share a photo that I posted really really early on the Barbie Bulletin Board years ago (now known as the BFC/Barbie Fan Club). Continental Holiday in Paris. This was when I was first starting to experiment with back drops. I had a framed picture of a window scene of Paris hanging on a wall at the time. Photographing Barbie with a back drop was very new to me when I took this photo. It fulfilled a creative urge. At the same time I felt a bit crazy in the head. But it was a pretty picture, so I kept moving forward with it. For me, a vignette is a way to bring the doll to life. It tells her story. It gives her character. And it is the best way to enjoy the furniture and accessories that I know of. I have found that I actually enjoy collecting furniture and accessories as much if not more than Barbie. Miniature works of art I call them, and they speak to a gal who thought she loved doll houses but soon learned Barbie was much more fun than stuffy Victorian porcelain dolls. I found I enjoyed them so much, that I dreamed up a cabinet in which I could display more than three ideas for vignettes, as I only have three cubes. I designed it, my Dad built it, and it is one of my favorite things in the world (aside from my family!). For those that follow my Flickr page, most of these pictures are repeats. I promise I will share lots of new and interesting photos here once I move pass this introduction stage (I have a dress shop to share soon … just sayin!). I get so many questions and comments regarding the cabinet, that it inspired me to share here on my blog. Lingerie #4 Silkstone atop a customized Susy Goose Bed. A personal favorite because it is my favorite color combination. Detail of vignette wall art. Fashion Editor and Lingerie #5 in Breakfast At Tiffany’s dress combined with custom hat. The lingerie on the mannequin was a commissioned piece for my Silkstone lingerie shoppe called “La Boutique Angelique”, a shoppe I will surely share here on the blog at some point. “French Blue” …. who doesn’t love a combo of blue and gold?! I have since swapped out this vanity for a lovely writing desk, but I may go back to this again. I have to share the detail of the doll house paper used in this cube. It is appropriately titled “Marie Antoinette”. I have an obsession with cherubs, so I had to have it and use it in this cabinet. The Shopgirl Barbie in an amazing sheath by Bellissima Couture. I customized this Susy Goose vanity well over 10 years ago utilizing Krylon for Plastic spray paint in Fairytale Pink. So this is where my passion lies in my Barbie collection. The scenes inspire me and satisfy personal decorating ideas that I may not necessarily do within my own home. What I mean by this is that I could live in Marie Antoinette-land all day long, but by husband and children, they’re so crazy that they may not necessarily agree with this. So I create a snapshot of an idea within a small cube within my doll room’s 4 walls, and I am free to use all the blue and gold and pink and black I want! Introductions – My First Blog Post! Hello! I have been considering starting my own Barbie blog for a couple of years now. This is surely to be a learning experience, a journey, that hopefully will be fun and rewarding. I really enjoy blogs that other collectors out there have, and I’d like to think that there is room for one more blog in this awesome collecting community we have. We all collect differently, and it is fun to see how others collect and display. The best part is the sharing. It inspires us! Now, lets just be honest. MANY collecting days have passed since this first acquisition into my collection. Would I walk into a store and choose this doll today? No. But I still have her, because she is the one that led me down this path, and I will never say goodbye to this doll. Plus, if you follow my blog, you soon will learn that I’m extremely sentimental. That monumental exchanging of the gifts started around the time when Barbie’s 35th Anniversary was all the rage. Toys R Us’s Barbie collecting displays and stock were at their all time prime. Barbie hoarders were abound, and it was a new and exciting venture for two gals that decided from that from that day forward, they were officially Barbie collectors. Kathy and I arranged “Barbie dates” where we went to Toys R Us monthly to choose new and fun Barbie’s for us to collect. We NEVER considered deboxing, because surely the deboxing of these precious Barbies would lose their value, right??? Yes, I was once of that mindset. Fast forward to today. I type this as I sit in my cherished doll room (and 1/4 office) in a house that my husband and I built 10 years ago. I am now the mother of two beautiful daughters (YES! says the Barbie collecting moms!) ages 7 and 10. Today, I have a collection that would blow the mind of that then 24 year old New Jersey girl. I don’t know that I expected to continue collecting at the level that I do today. I didn’t know then that my love for doll house 1:12 scale and my love for photography (I met that dear girl Kathy in a photography class in New York City!) would combine at some point in my life with a hobby of collecting Barbie, and that the three interests would somehow mesh into a fun and rewarding venture. There is more to my doll room, of which I plan to share here on the blog. Several collectors in our awesome community have already become familiar with my love for the hobby and my collection via my photos at Flickr and my posting on the Barbie Collector forums. I wanted to start a blog because whereas I’ve enjoyed sharing on these public websites, I have found over time that I desire a more concentrated format, one that lends itself to demonstration and heartfelt conversation. I expect that there will come a day when I cringe at my first blog post, sort of like I cringe at the first photos I posted to the Barbie Fan Club forums. Over time, we get better as we challenge ourselves to improve. By no means am I a journalist, a writer, or a professional blogger. I’m a collector that enjoys creating and photographing Barbie displays, which may creep some people out, but I’ve learned to live with that! I enjoy sharing with those that are like minded. I love displays. I love vignettes. I love collecting and customizing 1:6 scale furniture. I mainly collect the Barbie Fashion Model Collection, but I do focus on some modern vinyl Barbies as well as repros (and a tiny bit of vintage). I also LOVE and collect Liddle Kiddles. 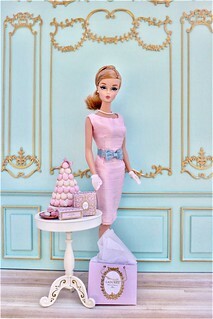 My blog will focus on three of my favorite combinations: Barbie, photography and 1:6 scale furniture and accessories. Thus, creating what I have come to love as “The Barbie Vignette”. I will not be the blog that reports the latest news flash in our community, as there are several already that do it so well. I thoroughly enjoy fellow Barbie bloggers and the content of these firmly established blogs. My focus is entirely different. 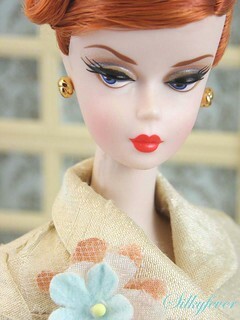 My next post will elaborate on what the Barbie Vignette is in my collection, and why it is so special to me. 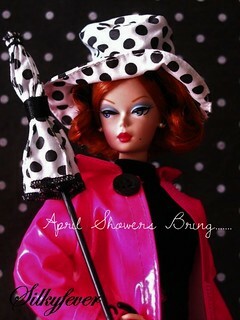 I invite you to visit my little slice of dolly heaven with this Barbie blog!